Your waist circumference is one way to determine whether you have an increased amount of fat around your belly and whether you’re at an increased health risk. • Place a tape measure around your bare stomach at the most-narrow circumference just above the upper hipbone, usually at your belly button or above. Measure in centimeters because it is easier to read and calculate the ratio. • Make sure the measuring tape is parallel to the floor (slanting can falsely increase your measurement). Also ensure that the tape measure is snug to your body, but not so tight that it compresses the skin. Exhale while measuring and relax your abdomen. • First look in a mirror and identify the widest part of your buttocks. • Then place the tape measure at this location and measure around the circumference of your hips and buttocks. Measure in centimeters because it is easier to read and calculate the ratio. 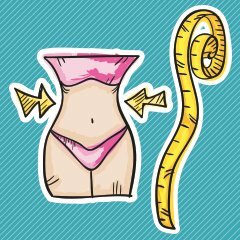 This ratio compares the size of your waist to the size of your hips. The smaller your waist is in comparison to your hips, the lower your risk for heart disease. 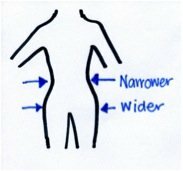 Even if you’re overweight and have a high waist circumference, your waist-to-hip ratio is an important measurement. • Calculate your waist-to-hip ratio by dividing your waist circumference by your hip circumference. • After you’ve determined your waist-to-hip ratio, use the following table to check your level of risk.